Sarah has many years of experience and a great love of teaching the piano and organ. She is keen to help and inspire people to play to the best of their ability, to develop their knowledge and interest and to achieve a great sense of fulfilment in doing so. She teaches on a modern Yamaha piano but the period instruments that she and Nick have at home are available for those who would like to play appropriate pieces on authentic instruments. At present her pupils range from the age of 6 to well into adulthood, from complete beginners to those at an advanced level. She is a great believer in the value of having something to aim for, having performance opportunities as well as playing purely for pleasure. Many people like to take music exams and Sarah is very much in favour of these, when people are ready, but will certainly not insist that they do so. Some of her pupils have also entered for a variety of classes at local Festivals, thereby gaining much encouragement and confidence. Sarah holds an annual pupils’ concert in the summer at a local church, a joyful family event which most of her pupils at all levels choose to play in. She and her husband have also held informal workshop events for small groups at home. Sarah always wants to help pupils develop a sound technique and to choose music that they find inspiring and enjoyable, largely (but not exclusively) from the classical repertoire. Other important aspects are competence in sight-reading, the pleasure of being able to memorise music, including performing from memory if a student feels confident. Sarah often does duet playing with pupils and encourages composition where pupils want to be creative in that way. 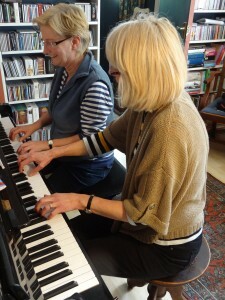 Contact Sarah for piano teaching in Arundel, West Sussex.